Tradition and artistry come together to create a spiral of trend-setting style. 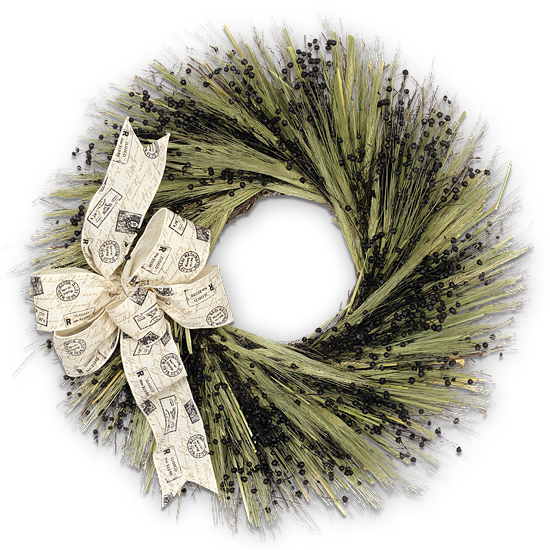 This unique wreath begins with a generous gathering of natural bearded wheat – an ideal ingredient for such a welcoming design as it’s said to symbolize home, hearth, love, and charity. Wisps of dried black flax add dimension and movement and a fun flourish of burlap ribbon with postal stamp design is tied to one side. Naturally neutral, yet uniquely intriguing, this wreath lets you send your best thoughts while delivering a dash of the unexpected. The colors will soften naturally over time and naturally air-dry. The designs are best maintained when displayed indoors, away from direct sunlight, strong heat sources and extreme moisture. Please note: outdoor display is not recommended.